Adorned with his signature clock, glasses, hats, and gold-rimmed teeth, Flavor Flav is one of the most recognized faces in America today. 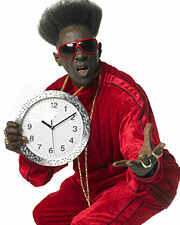 Inventing the role as a member of the ground-breaking rap group Public Enemy and known for his unique persona and flamboyant style, Flavor Flav has become one of the greatest hype men alive. Join us as we welcome Flavor Flav to the Clive Davis Theater to discuss his new book, Flavor Flav: Icon. Written in his own unique style, Flavor Flav captivates audiences with his honesty about tensions within Public Enemy, issues with Def Jam Records, reality TV and his experiences in and out of jail and rehab. Hear Flavor Flav in discussion about his about the new book, a fascinating portrayal of his life successes, failures, and perseverance, with Vice President of the GRAMMY Foundation Scott Goldman. Flavor Flav will take questions from the audience and be available for a book signing after the event.